The Applied Probability Trust is an independent, not-for-profit foundation for study and research in the mathematical sciences. The APT serves the mathematical community by providing a publishing forum for research and review. The APT’s editorial office continues to be located within the School of Mathematics and Statistics at The University of Sheffield, where it was established during Joe Gani's (founding Trustee and Editor) professorship between 1965 and 1974. Together, Journal of Applied Probability and Advances in Applied Probability act as the forum for original research in applied probability and its applications. For researchers in operations research, telecommunications, computer engineering, epidemiology, financial mathematics, information systems, and traffic management. Visit the Applied Probability Trust website for more information. 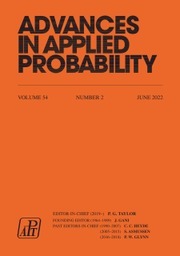 With a publication record spanning more than five decades, the Journal of Applied Probability is the oldest journal devoted to the publication of research in the field of applied probability. It is an international journal published by the Applied Probability Trust, and it serves as a companion publication to the Advances in Applied Probability. Its wide audience includes leading researchers across the entire spectrum of applied probability, including biosciences applications, operations research, telecommunications, computer science, engineering, epidemiology, financial mathematics, the physical and social sciences, and any field where stochastic modeling is used.